The parish of All Saints Middleton Cheney is part of the Chenderit Benefice. The benefice comprises 6 parishes, Middleton Cheney, Chacombe, Marston St Lawrence, Greatworth, Thenford and Warkworth. Large numbers of people visit the church each year to view the stained glass windows created by William Morris, drawing upon the talents of many Pre-Raphaelite painters such as E Burne-Jones and F Madox Brown. 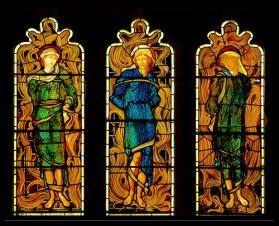 The west window depicting the Fiery Furnace was the work of E Burne-Jones and is one of the most dramatic windows ever produced by the Morris firm. We look forward to the arrival of Rev. Nicholas Leggett as Rector of the Chenderit Benefice; and welcome him and his family to the New Rectory in Middleton Cheney. There will be a service of Institution for Rev. Nick at All Saints, Middleton Cheney, on Saturday 3rd. February 2018. He will be joined by Rev. Carolyn Oley as assistant priest, based at Marston St. Lawrence. All Saints Church is usually open on Wednesday mornings from 11a.m.-1 p.m. ' and 'First Steps group for children 0 to pre-school age and their parents/carers, takes place at All Saints Wednesday afternoons 2p.m. to 3p.m. in term time. This is a free session of songs, stories and activities. New faces always welcome. No one knows how long there has been a church on this site, but there was a settlement here before the Conquest when the land was granted to the Chenduit Barons, thus giving the village the name we know it by today. The present church dates from circa A.D. 1300 – or at least the window openings and the south doorway are from that date. The arcading was probably added in A.D. 1322-35, the years when William of Edyngton was Rector. William later became Bishop Of Winchester, where he was responsible for the building of the west front of the Cathedral. The church has changed considerably in appearance since then. The south chapel, which later housed the organ was an early addition; and what is now the priest's vestry was added a little later. This must have originally been a chantry chapel since it has a piscina for the washing of sacred vessels. Soon after the changes to the roof line the tower was rebuilt in its present form. At the same time the great west doorway of the Annunciation was made. This door was clearly intended to replace the south porch as the main entrance to the church, so the early bells must have been rung from what is now the clock chamber. 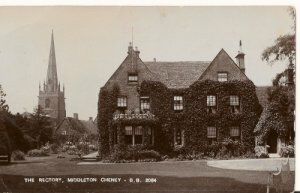 When the Rev Buckley arrived in Middleton Cheney he had the church and rectory completely restored. 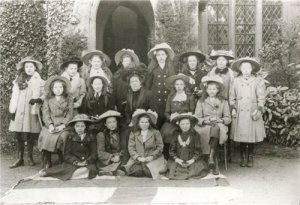 An article in the local newspaper, the Banbury Guardian, estimated that the restoration of the church was £2000 and the enlargement of the churchyard £400. It is interesting to note that at the same time there was an agricultural strike in the village in protest at the low wages received by farm workers. However, the parishioners agreed to borrow £600 on the rates. The rector and some of his family promised £600 for the chancel. Brasenose College promised £150 and other donations amounted to £150. Other subscriptions were, "earnestly requested!" At this time the pews and galleries were removed, the tower arch opened and the sittings throughout the church made open and uniform. Inside the church the pulpit and roof were repainted as part of the 1865 restoration by George Gilbert Scott R.A. who was a personal friend of the, then new incumbent, William C. Buckley. The screen was not repainted but clear traces of the original colours can still be seen on close inspection. In the 1990s it was confirmed that William Morris had designed the painted pattern on the ceiling. He was dedicated to promoting high quality workmanship in the late 19th century through the Arts And Crafts Movement. 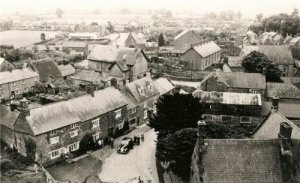 A Mr Cottam of Castle Street in Banbury, who listed his trades as plumber, painter, decorator and gilder was appointed to carry out the work. The pulpit was moved by Scott from its' medieval position against the easternmost pier of the north arcade. An eighteenth century support for a sounding board can still be seen there. 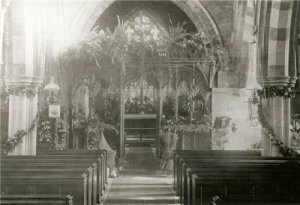 It was a local custom to strew the church in summer with hay gathered from six or seven swathes in Ash meadow, which were given for the purpose. The rector found his own straw in the winter. This custom probably fell into disuse at the time of the Inclosure (1769). 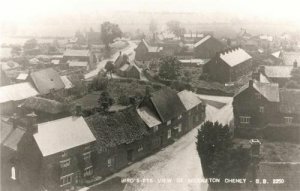 An important local firm, the Bagleys of Chacombe made five of the bells, dating from 1640 to 1693, although James Keene of Woodstock made one for the main peal. The windows are Middleton's greatest glory; making it a place of pilgrimage for anyone with a passion for Morris glass. Practically all the members of the William Morris firm had a hand in the making of the east window. Other windows in the church are attributed to various members of the firm although those in the south aisle are of, as yet, unknown origin.